If you’re looking for a nutritious and protein-packed meatless meal, our recipe for sweet potato and eggs tacos recipe is just the thing to try. You and your family will love this dish. It’s great for you because everything comes together in less than an hour, and your family will love it because it’s so tasty! Our recipe for sweet potato, sage, and eggs tacos is excellent to have on hand because you can make it for dinner or breakfast. Fill up your bellies in the morning to get your family ready for your exciting weekend activities. Or, perk everyone up after a busy day with this delicious dinner. Whatever the occasion is, your sweet potato and eggs tacos recipe is sure to be a big hit. Just be ready — after you make it once, you’ll be making it again! 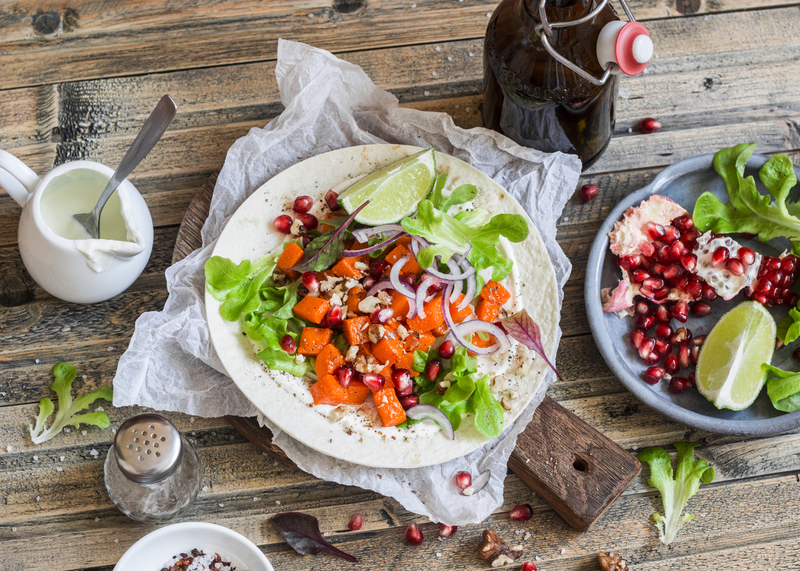 If you’re ready to make homemade sweet potato tacos his week, check out the recipe below. Add 2 tablespoons of the olive oil to a non-stick or cast iron skillet. Heat the oil over medium to medium-high heat until it shimmers. Add the sweet potatoes and season them with salt and black pepper. Saute the potatoes until they are soft and lightly browned, about eight to 10 minutes. Add the garlic and sage to the sweet potatoes. Saute it in until it’s well-combined and the mixture becomes fragrant, about 30 seconds to a minute. Put the mixture into a bowl, cover it, and keep it warm. Wipe out the skillet and add the last tablespoon of oil. Heat the oil over medium-high heat until it is shimmering. Make sure the oil covers the entire skillet evenly. Cook the eggs sunny-side up. Crack the eggs into the pan and season them with salt and black pepper. Cook them until the whites are set, and the yolk is still runny — about two to three minutes. Take four plates and add two taco shells to each. Divide the sweet potatoes among the eight tacos, adding a fried egg to each one. Top them with hot sauce, cheese, sour cream, and cilantro. Serve. You want to serve yourself and your family only the best ingredients. Sauder Eggs make every recipe extra delicious, but you also know you’re using quality eggs. Our eggs come from our reliable farmers who agree with us — quality is the most important thing. Make sure you check out our store locator to help you find the shop closest to you with our top-quality eggs.